By Phillip Hardberger. Published by Lexis Nexis Matthew Bender. 1996. 5th edition. 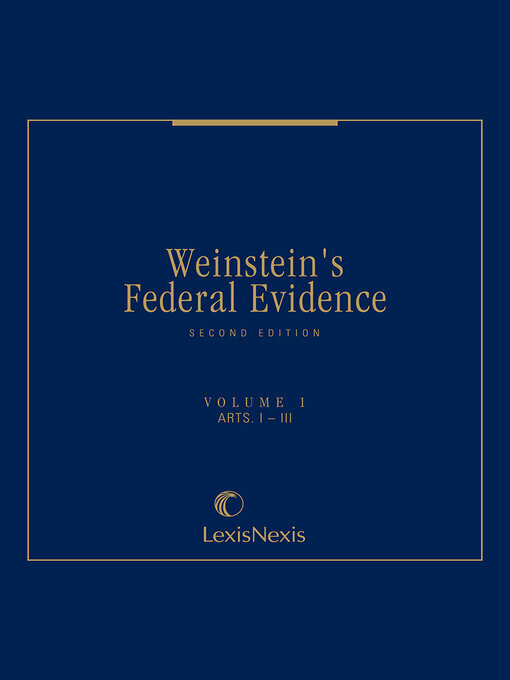 This annually updated volume provides a topical arrangement of evidentiary issues. Within each topic the author provides the Texas Rule, the federal equivalent and then key cases and commentary. Appendices provide the text of the rules, a table of cases and detailed subject index. By Lexis Nexis Matthew Bender. Published by Lexis Nexis Matthew Bender. 1979. 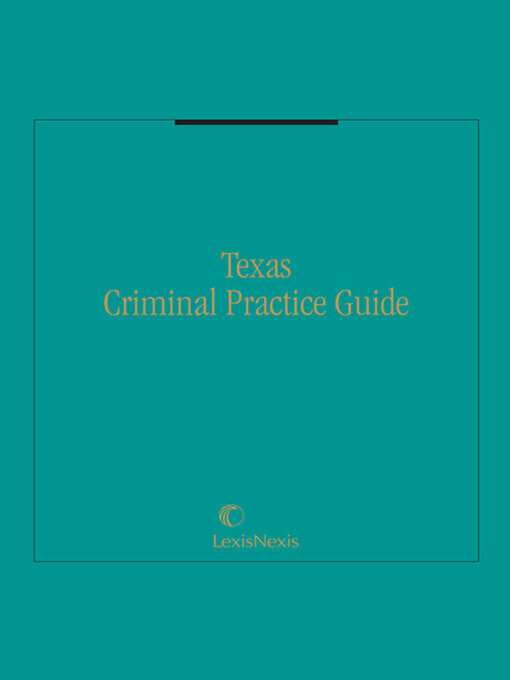 This guide's six volumes are arranged by section to correspond with the progression of the Texas criminal justice system, making their detailed information easy to access. Each volume contains a number of chapters divided into four parts covering legal backgrounds, procedural practice tips, sample forms, and research resources and bibliographies. By David Schlueter. Published by Lexis Nexis Matthew Bender. 2015. 5th edition. 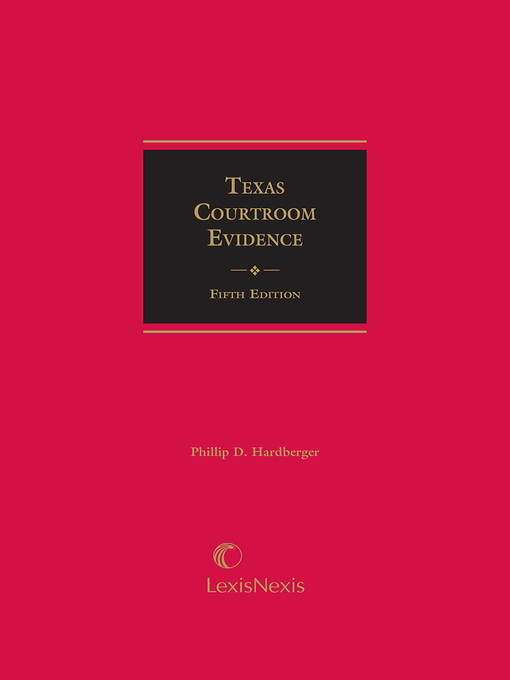 Written for the attorney new to practicing in Texas courts, this title covers basics of the law of evidence in Texas and the details of the real world of Texas trial practice. This fourth edition offers analysis of modern technical evidentiary issues, including the authentication of email, caller identification, and computer simulations. The process for offering social media conversations and statements in to evidence is also added. 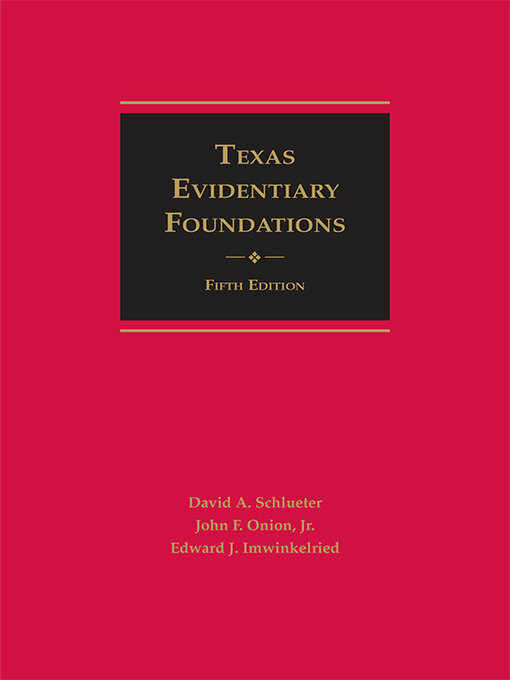 The complete Texas Rules of Evidence is included as an appendix. By Anthony J. Bocchino. 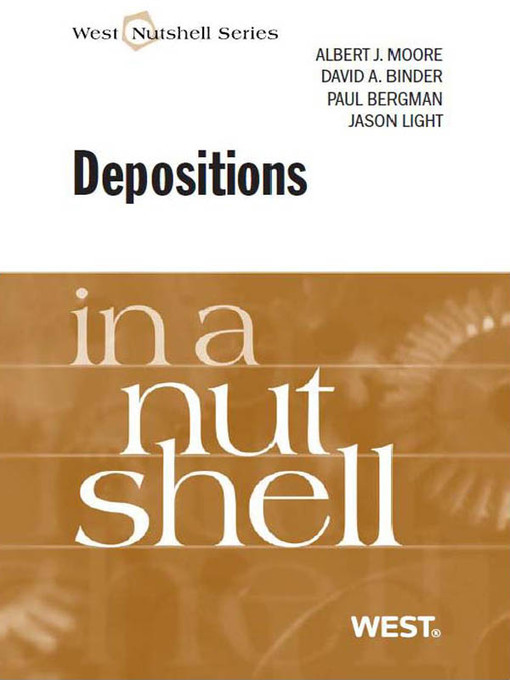 Published by National Institute for Trial Advocacy. 2015. 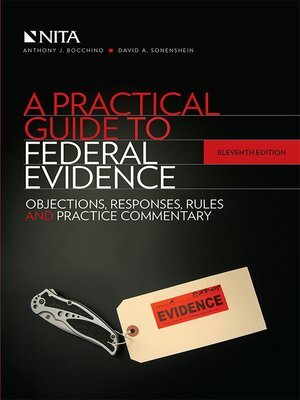 Whether in moot court or trial, A Practical Guide to Federal Evidence, Eleventh Edition, will guide you to mastery of making and responding to evidentiary objections. Objections and their responses are grouped by subject category of the objection for easy location. The extensive practice commentaries given for each objection will help you understand the application of the Federal Rules of Evidence in practice and enable you to deal with the common issues that arise. This edition also includes the 2011 restyling of the rules and current amendments through December 2014. 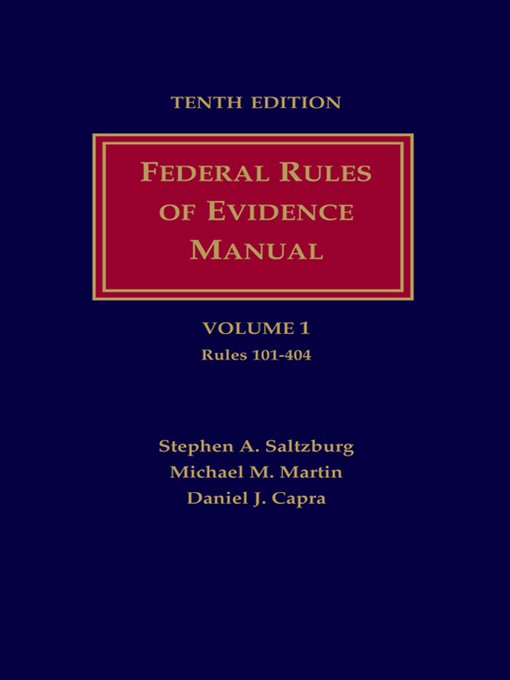 The Federal Rules of Evidence and a quick reference guide to objections are included. The handy quick reference guide includes only the minimum language required to make or respond to objections for quick use in moot or trial court and provides reference to the more detailed explanations in the text. The eBook versions of this title feature links to Lexis Advance for further legal research options. By Jefferson L. Ingram. Published by Elsevier Science. 2014. 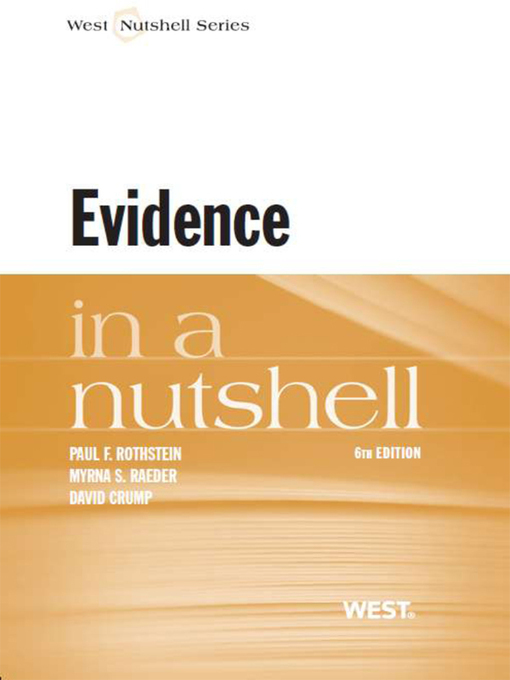 "Criminal Evidence is a well-respected and trusted introduction to the rules of criminal evidence for criminal justice students and professionals. 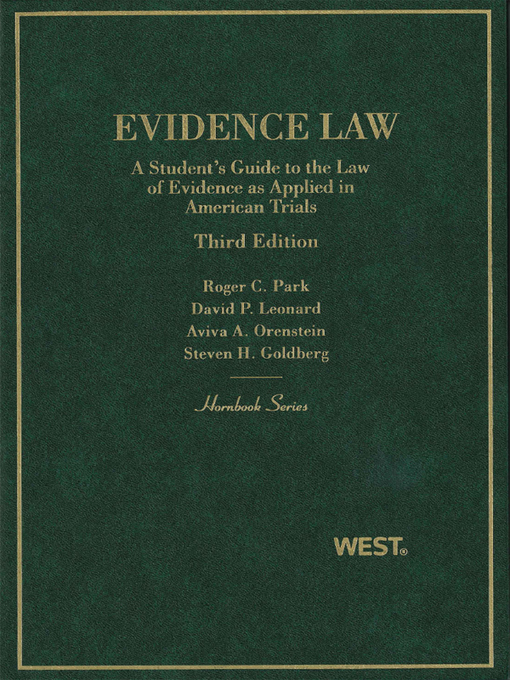 The first half of this book follows the Federal Rules of Evidence in its explanation of how evidence is collected, preserved, and presented in criminal court. The second half provides a selection of relevant criminal court cases that reinforce these basics and provide the context of how these rules are currently practiced. Readers will have an understanding of how concepts of evidence operate to convict the guilty and acquit the innocent. Part of the John C. Klotter Justice Administration Legal Series, this twelfth edition provides many updates, new references to recent cases, and a current version of the Federal Rules of Evidence. Student aids include chapter outlines, key terms and concepts lists, a glossary, a table of cases cited, and online interactive case studies. Teacher resources include Instructor's Guide, test bank, and PowerPoint slides. By Edward Imwinkelreid. Published by Lexis Nexis Matthew Bender. 2007. 2nd edition. 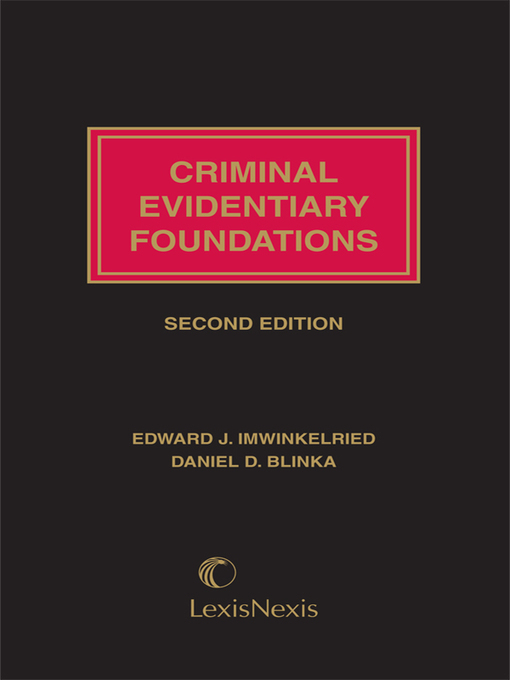 This text describes in detail how to create a foundation that ensures that the evidence presented in a criminal trial is admissible. Some of the topics covered are competency of witnesses, privilege, hearsay rule and motions to suppress evidence. Chapters include an evidentiary foundation, its doctrine, elements of the foundation and sample foundations. By Albert Moore. Published by Thomson West. 2010. 1st edition. By David Lazer. Published by MIT Press. 2012. 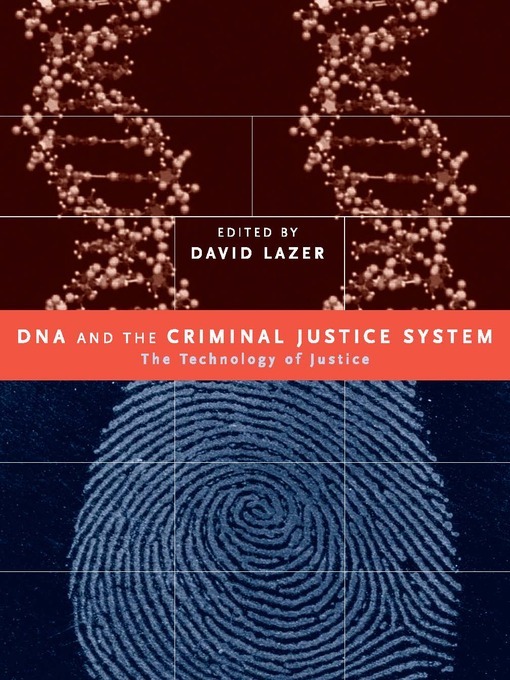 A critical look at the use of DNA in the criminal justice system both historically and in the future. Written by a group of distinguished experts, including U.S. Supreme Court Justice Stephen Breyer, this collection of essays provides insight into the use of DNA evidence. Topics discuss the advancement of the technology in criminal justice and the trade-offs between individual freedom and societal interests. By Paul Rothstein. Published by Thomson West. 2012. 6th edition. By Roger Park. Published by Thomson West. 2011. 3rd edition. By Edward Imwinkelried. Published by Lexis Nexis Matthew Bender. 2015. 9th edition. Evidentiary Foundations looks at all major evidentiary doctrines. 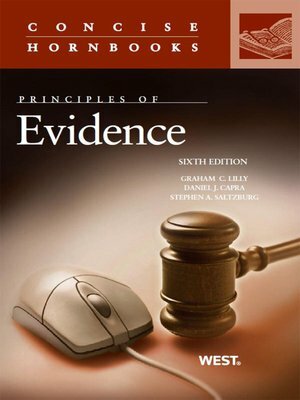 In this 9th edition the author looks at each doctrine, cites to the applicable Federal Rule of Evidence, discusses the leading cases on the topic, lists the foundation elements, and then gives an example of a sample foundation. Each foundation element is given a number which is used again in the sample to help illustrate how the foundation is used. By Edward Imwinkelried. Published by Lexis Nexis Matthew Bender. 2015. 4th edition. 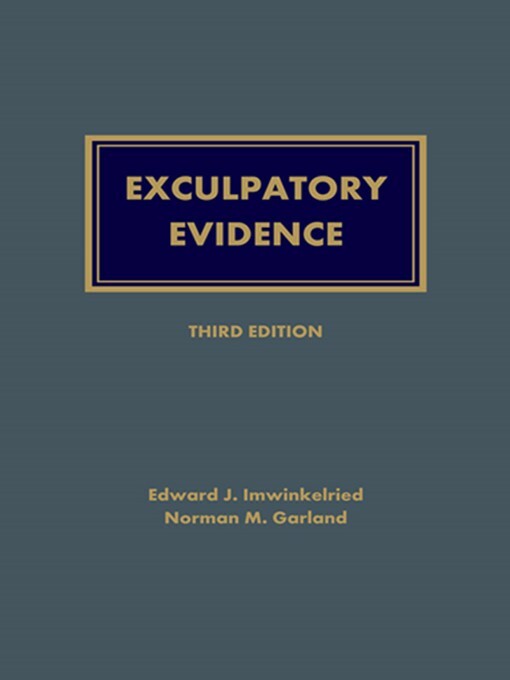 In the foreword the authors note that “In Washington v. Texas, 388 U.S. 14 (1967), the Supreme Court elevated to constitutional status the right to present exculpatory evidence.” The authors created this volume to be a comprehensive examination of the development of the defendant’s right to present exculpatory evidence. Defense attorneys need to be aware of every possible avenue to overcome the evidentiary exclusionary rules that might present a roadblock to presentation of exculpatory evidence. By Elizabeth Loftus. Published by Lexis Nexis Matthew Bender. 2013. 5th edition. This valuable long-lived title was updated in 2013 to its fifth edition. 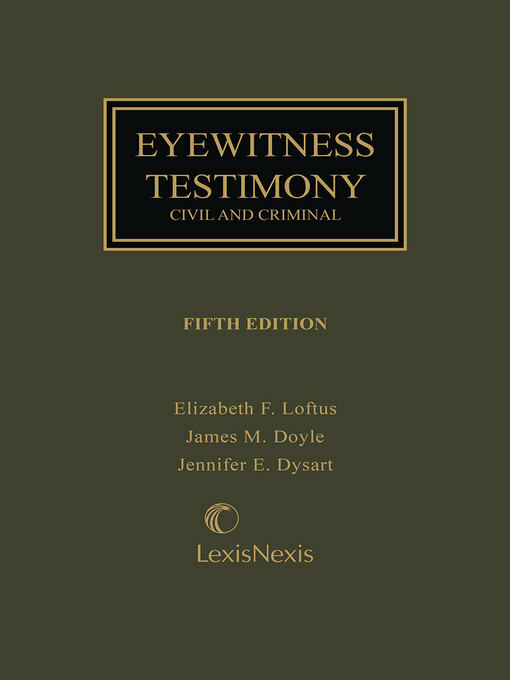 In the foreword, the authors reiterate “the conversation between working lawyers, investigators and psychologists—between the lab, the street, and the courtroom—is constant.” With this active collaboration, eyewitness testimony is constantly the subject of rigorous research. Based on psychological research and observation of the legal system’s use of eyewitness testimony, the team of authors examines how to elicit reliable recollections and how to test the reliability in a courtroom setting. Valid science is described in accessible terms and contrasted with “junk science.” Numerous examples taken from legal cases and scientific studies make this an interesting and valuable resource. By Stephen Saltzburg. Published by Lexis Nexis Matthew Bender. 2015. 11th edition. By Donald Shelton. Published by Rowman & Littlefield. 2011. "Forensic Science in Court explores the legal implications of forensic science—an increasingly important and complex part of the justice system. Judge Donald Shelton provides an accessible overview of the legal issues, from the history of evidence in court, to "gatekeeper" judges determining what evidence can be allowed, to the "CSI effect" in juries. The book describes and evaluates various kinds of evidence, including DNA, fingerprints, handwriting, hair, bite marks, tool marks, firearms and bullets, fire and arson investigation, and bloodstain evidence. Assessing the strengths and limitations of each kind of evidence, the author also discusses how they can contribute to identifying the "who," "how," and "whether" questions that arise in criminal prosecutions. By Michael Bowers. Published by Academic Press. 2013. By Michael Kurland. Published by Ivan R. Dee. 2012. "The rise of scientific thinking in finding, catching, and convicting criminals—and, just as important, freeing the innocent—has transformed society's assault on crime. Before scientific detective work, early attempts to maintain public safety relied on the severity of punishment rather than any probability of apprehension. But with the rapid development of the sciences in the nineteenth century, some techniques began to spill over into more effective police work. Michael Kurland's engrossing history of forensic science recounts this remarkable progress, which continues to the present. He traces the history of the major techniques of criminal detection and many of the minor ones. Here are Bertillon's physical measurements used to recognize habitual criminals; the study of fingerprints identifying criminals long after they have left the scene of the crime; Gravelle's comparison microscope comparing bullets to determine if they have been fired from the same gun; the development of bloodstain identification and, ultimately, the blood type involved. Mr. Kurland explains how once–accepted techniques have fallen by the wayside—handwriting analysis, for example—and how methods such as lie detectors, voice spectrum analysis, bite mark evidence, and other methods have proven unworthy. By Kenneth Broun. Published by Thomson West. 2014. 7th edition. By Graham Lilly; Daniel J. Capra; Stephen A. Saltzburg. Published by Thomson West. 2012. 6th ed. By Joseph McLaughlin. Published by Lexis Nexis Matthew Bender. 1997. 2nd edition. 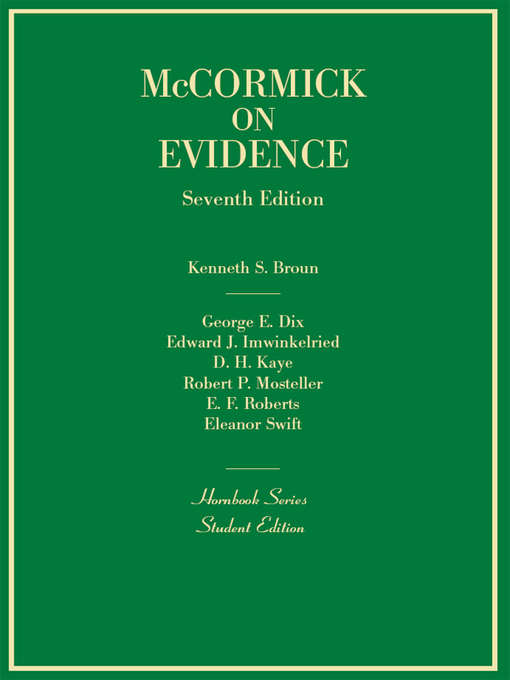 The preface explains that the goal of this five volume treatise is "to present in readable prose an account of how the most modern codification of the law of evidence has fared in the federal courts." While the focus is on current law, historical information is presented in appendices. A table describing of state and military adaptations of the Federal Rules is included.